Siem Reap isn’t known for its fitness scene, but more and more gyms are popping up all of the time, and there’s a range of options to appeal to just about anyone. In this post we’ll cover the best gyms in Siem Reap, including Western-style, local gyms, a fight club, and lots of classes. One of the most popular gyms in town with expats, Sokha isn’t perfect but it is air-conditioned. 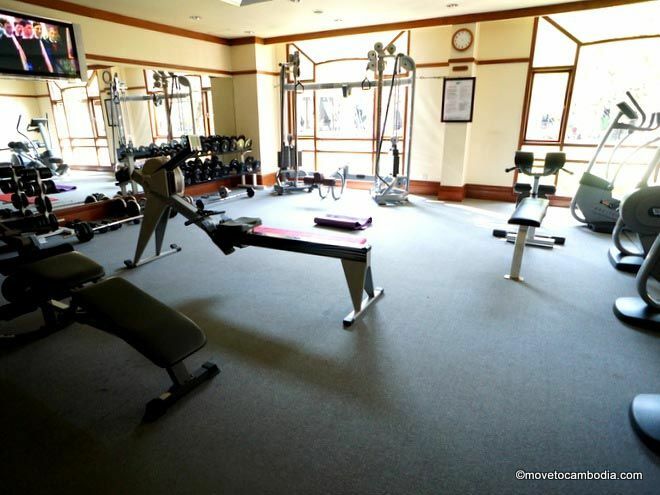 The gym at Sokha Angkor Resort is small, clean, and air-conditioned. The free weights and resistance training room is under-equipped compared to some of its other competitors but there is still a decent selection of dumbbells and weights and the machines will accommodate a reasonably varied workout. What they do have though, is a lot of good quality cardio training machines, from stepping and rowing machines to ellipticals and treadmills. The cardio machines are located in a separate room from the weights so you can really zone out in here and burn some cardio calories in here. Being a more upscale hotel they have a sauna, jacuzzi, and steam room, and the cover charge for the gym will give you access to the one of the best swimming pools in Siem Reap. Towels and lockers are available and they have cold water dispensers in the gym. The daily rate of $15 is more expensive than many other gyms around town but the range of facilities is unparalleled. They also have fairly expensive monthly and yearly rates available, but they offer large discounts for longer-term memberships. Sokha is opening a new location with a gym that promises to be the largest in Siem Reap. We’ll update this post once we have the chance to check it out. Angkor Inter Fitness is Siem Reap’s first standalone Western-style gym. 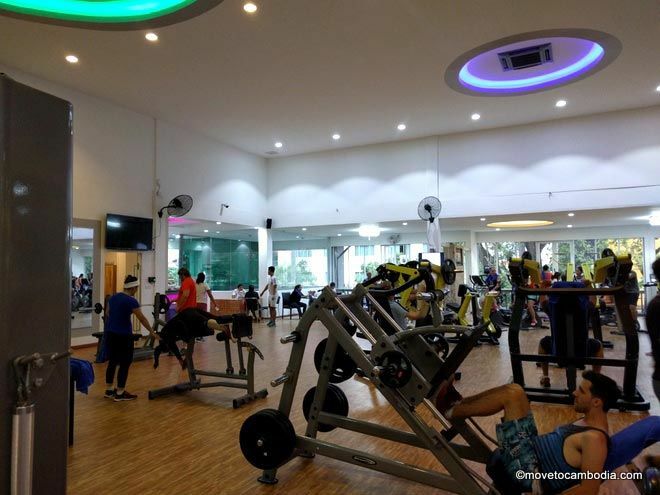 A recent addition to the fitness circuit in Siem Reap, Angkor Inter Fitness is the town’s first standalone Western-style gym. 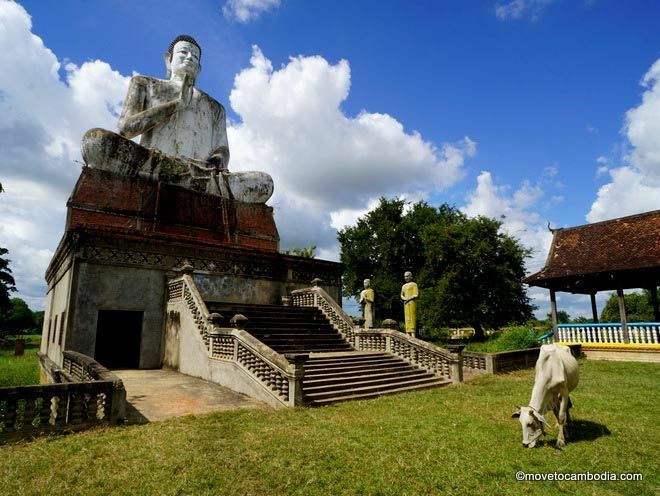 The well-equipped gym is staffed with very approachable Western and Khmer trainers, and they offer aerobics, yoga, and TRX (suspension training) classes. The very high ceilings mean the not-very-powerful air-conditioning can sometimes struggle to cool the space but it is airy, clean and well-lit. There are plenty of resistance and cardio machines, and they also have a huge studio space complete with full-length mirrored walls and medicine balls, mats, and steps if you prefer to work out in peace and quiet, outside of the main gym area. Lockers and towels are provided at the front desk and there are showers and sauna rooms for post-workout decompression. If you prefer to work out in a less crowded gym then head there mid-morning or afternoon as it can get pretty busy in the evening. The daily rate is $5 and they have various other membership options available — when we asked there was an introductory rate of $50/month with discounts for long-term memberships and group rates. Angkor fight club is a Western-run gym specializing in Khmer boxing but they also run MMA, boxing and CrossFit classes. Opened in 2013 by three fight enthusiasts, Nick, Brandon and Sasha, the fight club has grown to become one of the most popular fitness hangouts in Siem Reap. Although a relatively small operation, they have two active fighters training there at the moment (Sasha Revolver and Justin Wong) and their beginner-level Khmer boxing classes are a very popular way for residents and tourists alike to burn off those excess calories. From time to time they also host guest trainers who visit the gym to train and share their expertise with the patrons. The environment is super friendly and all levels are welcome. Classes run in the evening from 6 to 9 p.m., but daytime training can sometimes be arranged as well as one-to-one sessions with any of the trainers/fighters. There is no air-con here but the evening class schedule means it is a lot cooler at that time of the day and the fans should keep you suitably refreshed. The extra equipment in the gym is limited, but the fight classes are really what the Angkor Fight Club is all about and fighting training is a fantastic way to get fit and you will also be pleasantly surprised by how satisfying it is to learn how to punch and kick properly. Boxing and sparring equipment is available for purchase and they have daily rates as well as a variety of membership options for longer term visitors. Some of the equipment is old, some is new, but everyone is flexing at Angkor Muscle Gym. 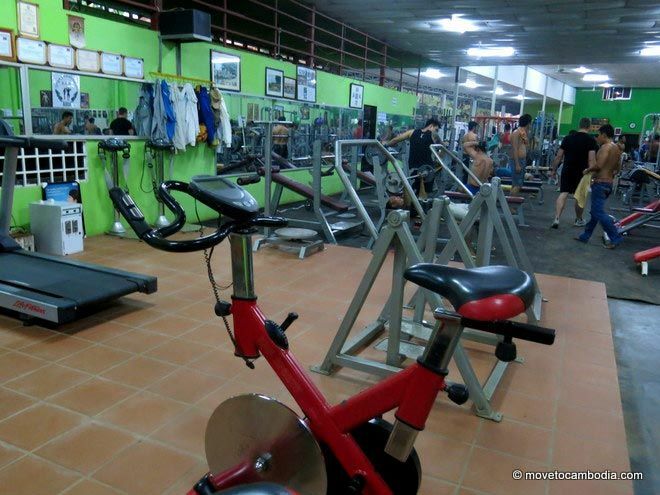 Angkor Muscle Gym is a cheap, local gym that sit on the banks of the Siem Reap River. At $1 for entry (including locker and towel) this is remarkable value for money (although locals only pay 2000 riel). It may not come with the luxuries of a more upscale gym like air-conditioning or sauna, but the range and abundance of equipment more than makes up for this. Angkor Muscle Gym is primarily a body building gym where the emphasis is on free weights and other forms of resistance training. There are a load of dumbbells, several benches (decline, incline and flat) Smith machine, two cable machines, lat pull down, squat rack, dipping stations and pretty much every other type of bench or machine that you could want. The wide range of equipment is great for an efficient workout because even if someone is using the equipment you want, there will be something else you can use instead that will do the same thing. There is also a reasonably sized studio area at the back for more aerobic-based workouts and plenty of mats for stretching or pilates/yoga-type exercises and a handful of cardio machines, although using the treadmill incurs an extra charge. Read the full review of Angkor Muscle Gym. SC Sports Club is located on Road 6 down a small track opposite Psar Leu. The local-style gym is a very large, hangar-like space filled with lots of resistance machines and free weights. There are a couple of exercise bikes and two treadmills which I have rarely seen being used, but in fairness the patrons do not seem to be cardio oriented. It must be said that it is a sweaty gym, decked out with full-length mirrors to monitor your progress (and many of the predominantly male visitors love to monitor their progress) but its real appeal is in the amount of free weights, dumbbells, and space it has to offer, not to mention the insanely low price of 2000 riel (50c) per visit. Lockers are free to use and there is a nice studio-type space up the back with pull-up bars and climbing ropes. It can get busy in the evening and is mainly used by locals but it is a very relaxed place to work out. Open daily, 6 a.m. to 9:30 p.m.
Open Monday to Friday, 3 to 9 p.m. and Saturdays 10 to 11 a.m.
Open 5 a.m. to 9 p.m.
Open daily, 5 a.m. to 9 p.m. 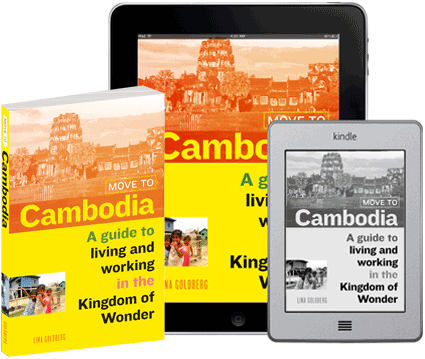 This entry was posted in Health & Safety, Siem Reap and tagged Angkor Muscle Gym, Siem Reap gyms, Sokha, Angkor Inter Fitness, Angkor Fight Club. Bookmark the permalink. hi,how much one time .I am A travaller. hi i interest on the gym play and i am new in siem reap , so where the location ?